Designed for use with both the Bowflex® SelectTech® 1090 and 552 dumbbells, this is a must have for your new Bowflex® SelectTech® Dumbbells. You never have to bend down to pick up your weights again. They're right there - ready to go. No strain. All muscle gain. Buy Bowflex SelectTech 2-in-1 Stand - FREE SHIPPING! 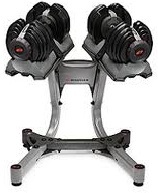 Fits both BowflexÂ® SelectTechÂ® 1090 and 552 dumbbells. Ultra-sleek design. Guarantee: Use your stand in your home for 6 weeks. If you choose to return it for any reason during that time, you can get a full refund of the purchase price (less shipping and handling).